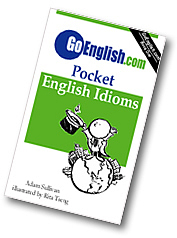 Today's Idiom = "I'm Off"
You say you are off when you are just leaving. Example: "Have a good day, you guys. I'm off." Reply: "Goodbye." Example: "I'm at work now, but I'm off in five minutes. Shall we meet?"